The time has come to do the “part 2” as you will of the DIY Disney Decor post I have done previously. Now, don’t get me wrong- none of these items I am about to show you have been made by me but they are fabulous still, (and some made by other people, does that count as DIY?). With that being said, welcome to this new and improved post about inventive and simple Disney decor that you can purchase to have in your own home/bedroom. All of the items I am going to talk about are absolutely perfect to replicate Disney magic in your home and I highly recommend all of them! As you know me, I LOVE bringing the simplicity and magic of Disney to the table and find the beauty in the simple Disney life. So put your feet up, grab your favorite cup of tea, (in a Disney mug, of course), and welcome to the new and improved HOME decor Disney post. These first two things I’m preceding to talk about are similar but unique in their own ways. The first, mounted on my wall with a layer of sticky, is a map of Neverland that is about 8X10 in size. I bought it last summer from this fabulous fair in Wisconsin called the Bristol Renaissance fair, (no pun intended seeing as part of my family is from the real Bristol). Before I go on, if you are of the area and have never been to this fair it is breathtakingly amazing. It’s all things magical and faerie land-ish set in the year 1574. It’s Robin Hood-esque is completely a great time and get this- you can eat turkey with your hands and watch women throw beers at men on stage. Anyway, within the fair there are tons of little shops and stands where you can buy things from hand-made jewelry to items from your favorite stories/books/lands. Here, I found a Neverland map which I just had to have to fit in with my collection. Next, I have a hand painted 9X12 (ish) poster of Alice with the flowers from the All in a Golden Afternoon scene in the original 1951 film based on the book by Lewis Carroll. The wonderful artist who painted this for me originates in France and her name is Morgane Brret, her Etsy shop is absolutely amazing and everybody NEEDS to check it out, (its MorganeBrretShop). I love the colors in this photo and even though I’m still in the market for a frame for it, it even looks good on its own perched up against the wall on a shelf. Speaking of hand painted, these next two items are from the same shop and they’re HAND MADE candles! What is better than candles which are hand-made, nothing? Ashton from Walter and Rosie Candle Co. is absolutely the sweetest. Before purchasing my very first candle from them, I had been wanting one for SO long, but since they are so popular they are very high in demand! Their shop opens at ever so certain times and you need to keep their Instagram post notifications on to get them right when they go on sale! Since they are hand made, they can’t keep their candle shop open 24/7, although some are up all the time as well as candle melters and some room sprays. 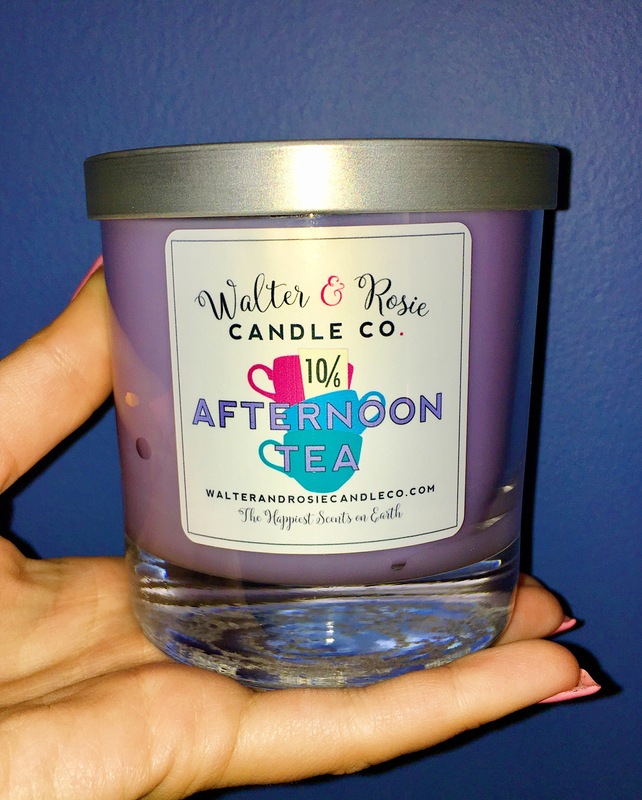 I originally ordered the first pictured scent “Afternoon Tea”, which is you guessed it, Alice in Wonderland themed! This candle is AMAZING! I want to say its one of the best candles I have ever smelled. It says in the description that it smells like lemon scented tea with a hint of sugar and let me tell you- that is spot on! It smells amazing and I am SO pleased with it. 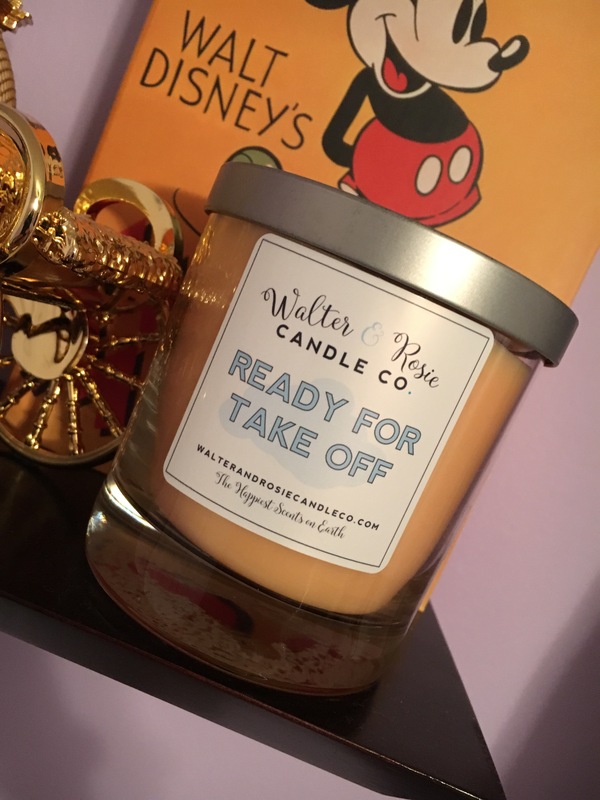 Going back to when I said Ashton was so sweet, they originally sent me the wrong candle from the Afternoon Tea candle that I had ordered by accident; they sent me “Ready for Takeoff”. Although wishing I had the original one that I had sent for- this candle smelled amazing, too! The description, again is spot on, says “fly over the orange groves of California with this citrus scent”, and it smelled exactly like oranges and sugar. It was to die for, and Ashton let me keep it as well. I HIGHLY recommend these candles, you guys! They are amazing and totally unique to the Disney community. If you are a Disney fanatic and love candles- or just love candles purely, these are for you! Next, we have here some more of the unconventional Disney home decor. The first, being a magnificent bluetooth SPEAKER! That’s right- that beautiful Cinderella’s carriage is a speaker and it’s actually a very good one, (although I didn’t purchase it needing a speaker). It’s very light weight and looks amazing on any shelf or nightstand, and you can get this beauty at BoxLunch for $49.50. I know that’s a little pricey but if you sign up for BoxLunch emails you get coupons throughout the year including a birthday coupon which I believe was %30 off which onto of BoxLunch cash, (similar to Hot cash at Hot Topic) was an amazing deal! I think I spent close to $20 on this which was a steal. Following the carriage speaker, is my newest member of my collection, Britto Stitch! Britto is a brand that does tons of Disney characters into little figurines like this one. Who got me hooked on it was actually my mom, seeing as she has the same size one in Pooh Bear! This stitch is what they would call the medium size and he’s absolutely adorable and SO colorful! He sits up so nicely on my Disney shelf! (: While at Disney the last time I went Cody and I saw this little guy for $70 which was WAY too much in my book. He had the bright idea of checking Amazon for a better deal, and I found it for $40! Even still a bit pricey, I totally think it’s worth it if they have your favorite character, (next is the Cheshire cat). We’re nearing the end with this adorable Mickey vintage plush and Peter Pan Pillow! My beautiful best friend Maddy bought me steamboat Willie for my birthday when I was in Disney with her last. I couldn’t actually find this on the Disney website or the Shop Disney Parks app, but she had gotten it from Mouse Gear in Epcot! It’s the cutest most minimally colored Disney plush I have ever seen and I can’t wait to bring it into my home as I grow up! Following the steamboat Willie plush is my Peter Pan pillow that my mom got me for my 19th birthday. I have a matching blanket, (not pictured) but she had gotten them from either Redbubble or Society 6. Even still, they are hugely adored and great pieces in my room! Following, is my newest pillow addition in my room that I actually got this year for my 20th birthday from my mom which is a round vintage Alice in Wonderland pillow from Zazzle! It fits so nicely on my refurbished chair that I bought at the flea market and I absolutely love that it’s the same Dodo bird drawing from the original story. Lastly, we have my infamous Neverland map tapestry, (can you see there’s a theme, here?). I actually had gotten this from Society 6 for my college dorm when I went to college, but now it’s hanging on my sitting room wall and it fits perfectly! I hadn’t ironed out the creases which I might do at some point in the future, but even still it fits my room perfectly and looks amazing as is. Society 6, Redbubble and Zazzle are AMAZING for Disney home decor. You can literally search anything and there will be something of the sort there in absolutely ever style and item imaginable. I highly recommend using these websites and having fun with the things you find and come up with! Thank you for reading the second installment of Sophie’s home decor and ideas, trust me, there is plenty more where this came from and I am likely to show all, but not yet! (Where’s the fun in that (; ).